Hanging wallpaper can invigorate any room's stale decor, but why risk ending up in the ER having a roller delicately wrenched from your...personage? 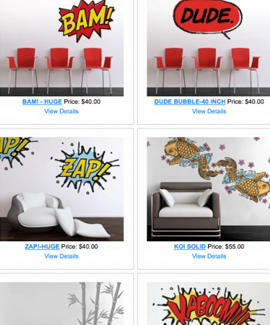 Spiff your pad while saving on plastic surgery, with Scribble on Walls. From a coterie of self-proclaimed "design geeks", Scrib's stock of adhesive wall-art's easily self-applied to your abode's partitions, a pleasant distraction from other things you live with, like peeling paint, your roommate's incontinent ferret, and the nagging sensation you'll never amount to anything. Wild out your room with comic book-style fight noises ("Bam! ", "Kaboom! "), cooler-than-they-sound flora & fauna (bamboo shoots, koi fish), a compressed oscilloscope-esque soundwaves, or even a flashy yellow boombox, with most available in multiple sizes for coyly concealing everything from raging fist dents to the gaping portal left by that a**hole Kool-Aid Man. Application's easier than a temp-tattoo: just remove the decal's backing, smoove it onto the wall, then remove the top coating of clear transfer tape -- or, follow Scrib's alternate application advice and "put it on a pet and see how long it takes them to take it off." Nice one, geeks. Perhaps best of all, Scrib has a surprisingly affordable custom design option ($1 per vertical inch assuming a 28" width) to turn your own inspired artwork/photos into decals, meaning your wall can now immortalize the cherished ER x-ray of the time you "accidentally" sat on a paintbrush.